A pangram is a sentence containing all the letters of the language it is written in. Here’s an elegant pangram in English which you’ve probably seen somewhere. But with Odia, it’s not that easy. Firstly, it has 44 letters instead of 26. The increased number obviously affects the length of the pangram itself. To add to that, we have some letters that are very rarely used- ଊ, ଐ or ଔ, as an example. Here’s the pangram I made. It has another nice feature though- there are exactly 10+34 words, with their first letters being in the order of the alphabet. That means that you can read out the entire alphabet from the first letters. This is wordplay typical of Odia literature, existing since almost a 1000 years. Also, in keeping with traditional literature, I’ve used ନ for ଙ, ଞ and ଅ for ଣ. Those letters are indeed present in other words though, to make this a pangram. What does it mean though? A lot. The meaning itself is reminiscent of heavy medieval Radha-Krishna literature and some familiar metaphors. Having said that, it also makes it quite poetic. No wonder it doesn’t lend itself particularly well to translation due to the cultural context being lost. It can be very difficult to not look weird in such a situation. I’ll try, anyway. O Cuckoo! Today, in this place, when I thought of worshipping Shiva¹ and invoking him as I sat alone, that destroyer-of-all-remedies, Cupid came. As the sun went away (that is, night descended) Cupid devised various ways [to torture] poor ladies. [He] surprises them with the jingle of his anklets, burns them in the fire [of passion] and frightens them with the beat of his drum. [Again, he] makes them shiver with his sidelong glance. [He] takes their sadness² as debt, and to return more grief as a despised form of interest, he entangles them in the tricks of the playful bee-like Krishna by leaving them at his feet. (1) Worshipping Shiva is believed to help one get his/her beloved. (2) Due to the absence of their beloved ones. Whew! Tell me when you’re out of the trauma. 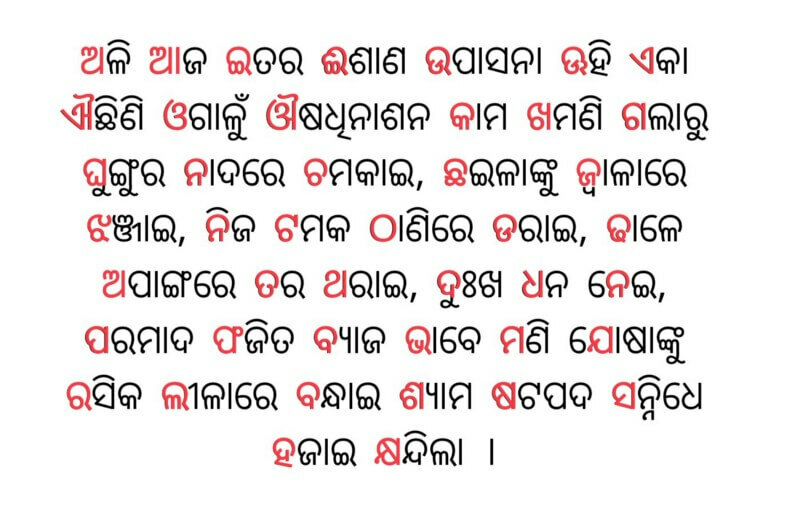 Update : This pangram can now be found on the Omniglot page for Odia all thanks to Subhashish Panigrahi. You can also find the other two pangrams on the page.